We would all love to believe that death will never occur. Unfortunately, this is never the case, which is why it is essential to prepare by choosing someone to be in charge of your estate and deciding who will receive your property and assets. With help, creating a will and trust is a straightforward process, and you can be sure that your family members will be well taken care of after your death. If you die without a will in place, the state divides your property and assets among your family members on your behalf. If you are unmarried and don’t have children, your parents will receive your property and assets. If you have children but aren’t married, your children and/or grandchildren will be entitled to them. If you’re married with no children, your spouse will receive all of the estate; unless one or both of your parents are alive, in which case they would receive half while your spouse receives the other half. If you are married with children, your spouse will receive half and your children will receive the other half of the estate. If you want to control the division of your estate, you need a will. A will allows you to divide your property any way that you see fit, even between people who are unrelated to you, which is something many people desire to do. 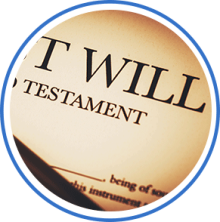 If you have property that you want to give to someone who may not otherwise be able to receive it upon your death, you may want to instate a trust. With a trust, the trustee will receive the property or assets on behalf of the person who will eventually receive it. For instance, if you want to leave a significant amount of money or property to someone, but you don’t want that person to receive it until age 25, you could name someone as the trustee who will then hold the assets until the recipient comes of age. Writing a will or a trust can be complicated, particularly when there is a significant amount of property or assets to be divided among many individuals. Understanding the laws in Kentucky regarding wills and trusts is essential in ensuring that everyone receives what you want them to upon your death. A Northern Kentucky lawyer can also help you if you encounter problems with a will or trust after the death of a loved one. If you have entered the probate process but are encountering legalities that you don’t understand, contact an attorney. Attorneys are proficient at handling probate, wills, and trusts, and can offer you the information and guidance you need to achieve your goals. Contact a Florence Kentucky wills and trusts attorney today for more information about your case. With a consultation, you could find out what you are entitled to and what others may be able to receive upon your death. Life after your death will continue, so take care of your loved ones as well as you do now with the help of a lawyer in Florence, Kentucky. Call a Knoebel & Vice attorney today.